I have been craving a burger. I'm not sure why since I have only eaten one or two in the past 10 years, but for the past few weeks I have been dying for one. Maybe it's the time of year, or smelling all the different grills going as I drive through our neighborhood. Or maybe I'm sick of veggie burgers. 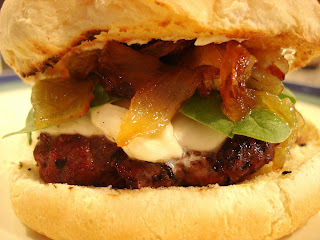 Whatever the reason, I was determined to make a fabulous REAL burger over the weekend. I decided to go for a different topping than what I would normally eat on a veggie burger - lettuce, tomato, ketchup, and mustard. I had caramelized onions in mind and used that flavor to figure out the rest. I didn't want to go crazy with flavors in the meat, so I only added minced onion, garlic powder, salt, pepper, and Worcestershire. Earlier in the day I made some caramelized onions by melting butter in a pan along with a touch of olive oil and adding in half of a sliced white onion. I cooked the onions on medium/low heat for about 25 minutes until they were golden brown. While the onions were caramelizing I added a pinch of thyme, salt, and sugar. When Jon was grilling the burgers I gave him a few slices of fresh mozzarella to melt onto my burger. Once the burgers were done and the buns were toasted, I finished with my toppings. On top of the cheese I added a few leaves of fresh spinach, and then topped it with a huge spoonful of the caramelized onions. That's all the burger needed! It was absolutely delicious and cured my craving...for now!